After busting five of my plastic plungers, I thought how ridiculous! I have a machine shop and should be able to come up with something that won’t break. After we made the aluminum plungers and installed them in my motorhome, we thought others would like them. 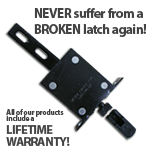 We first started rebuilding people’s old latches, and then started making new Fleetwood, Winnebago, Monaco type latches. Then people started calling telling us of the types of latches, built into baggage door handles. They said it only cost about $70.00 per new unit but $220.00 to get painted to match motorhome. So we made aluminum plungers for them. Next we were told the plastic plungers were not only breaking but also the finger that pulls plunger up would jump over stop on plunger. They would not be able to open the door. We made that plunger part# SP4.5-002 in two pieces; the second piece is thicker and screws on base, that won’t slip over finger. We now have five different plungers and latches that customers have requested and probably more to follow.